While Caine and Jupiter ascend to a ship, it is destroyed by a squad of Keepers who then attack them. Caine fends off the attack and manages to kill the Keepers and hijack one of their vehicles while protecting Jupiter. Afterwards, Caine realizes that Jupiter must be of great significance to both Titus and Balem, who are revealed to have sent the Keepers to Earth to capture her. He takes Jupiter to the hideout of Stinger Apini, another former soldier living in exile on Earth. As Jupiter discovers that she can control the bees in Stinger's residence, she is revealed to be galactic royalty. Stinger agrees to help Jupiter, but a group of hunters who initially were hired by Balem but bribed by Kalique capture her and take her to Kalique's palace on a distant planet, where Kalique explains that Jupiter is genetically identical to the dead matriarch, and therefore the Earth's rightful owner. Supported by Captain Diomika Tsing of the Aegis (an intergalactic police force), Caine retrieves her from Kalique, and takes her to the planet Ores (the intergalactic capital planet) to claim her inheritance. 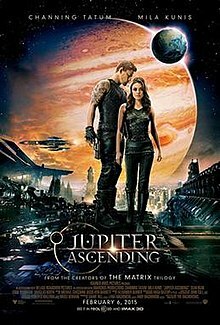 Jupiter Ascending received generally negative reviews from critics. Criticism has centered on the incoherence of the film's screenplay, Redmayne's melodramatic performance and its over-reliance on special effects, although the visuals, musical score, and originality were praised by some. On Rotten Tomatoes, the film holds a rating of 26%, based on 254 reviews, with an average rating of 4.4/10. The site's critical consensus reads, "Pleasing to the eye but narratively befuddled, Jupiter Ascending delivers another visually thrilling misfire from the Wachowskis." On Metacritic, the film has a score of 40 out of 100, based on 40 reviews, indicating "mixed or average reviews". In CinemaScore polls conducted during the opening weekend, cinema audiences gave Jupiter Ascending an average grade of "B-" on an A+ to F scale. ^ "Film Distribution – Village Roadshow Limited". Village Roadshow Pictures. February 11, 2014. Archived from the original on February 25, 2014. Retrieved February 11, 2014. ^ "JUPITER ASCENDING (12A)". British Board of Film Classification. January 14, 2015. Retrieved January 14, 2015. ^ a b c d "Jupiter Ascending (2015)". Box Office Mojo. April 5, 2015. Retrieved March 2, 2016. ^ a b c d e "The Wachowskis' Expensive 'Jupiter Ascending': What the Hell Happened?". Deadline. February 9, 2015. Retrieved October 29, 2016. ^ "Wachowskis hope to surprise with next film, 'Jupiter Ascending' – MSN Movies News". Movies.msn.com. October 27, 2013. Retrieved May 28, 2014. ^ "Douglas Booth interview: 'Romeo and Juliet is a scary prospect' – Movies Interview". Digital Spy. October 11, 2013. Retrieved June 13, 2014. ^ "Why Jupiter Ascending's Douglas Booth Makes Us Swoon | InStyle". News.instyle.com. Retrieved June 13, 2014. ^ Jen OrtizPhotograph by Matthew Brookes (January 4, 2014). "Interview with Romeo and Juliet Actor Douglas Booth". Gq.com. Retrieved June 13, 2014. ^ "Mila Kunis Full Interview – Ellen Show May 9, 2014". YouTube. Retrieved June 13, 2014. ^ Lavery, Christian (February 20, 2014). "Five questions: Mila Kunis". NYLON Guys. Nylonguysmag.com. Retrieved June 13, 2014. ^ "New Trailer For 'Jupiter Ascending' With Channing Tatum, Mila Kunis Released". Geeksofdoom.com. March 26, 2014. Retrieved June 9, 2014. ^ a b Driscoll, Molly (February 6, 2015). "'Jupiter Ascending': What are critics saying about the movie starring Mila Kunis?". The Christian Science Monitor. Retrieved February 8, 2015. ^ a b "Jupiter Ascending". Rotten Tomatoes. Fandango Media. Retrieved January 14, 2016. ^ a b c Donna Dickens (February 24, 2015). "'Jupiter Ascending' is the Sci-Fi movie women were waiting for". HitFix. Retrieved March 1, 2015. ^ a b Gavia Baker-Whitelaw (February 23, 2015). "Why women love 'Jupiter Ascending'". The Daily Dot. Retrieved March 1, 2015. ^ Chitwood, Adam (June 22, 2013). "Channing Tatum and Jamie Foxx Talk JUPITER ASCENDING & SPIDER-MAN 2; Tatum Says He Plays a "Hybrid Wolf and Human"". collider.com. Retrieved June 23, 2013. ^ a b Chris HeathPhotograph by Sebastian Kim (January 4, 2014). "Channing Tatum on How Kanye West Influenced Jupiter Ascending". Gq.com. Retrieved June 9, 2014. ^ Fleming Jr, Mike (February 5, 2013). "Sean Bean Joins Lana And Andy Wachowski's 'Jupiter Ascending' At Warners". deadline.com. Retrieved April 20, 2013. ^ Earnshaw, Helen (May 29, 2013). "The Comedian Exclusive Interview". Femalefirst.co.uk. Retrieved February 14, 2014. ^ "'Beyond the Lights' star can't believe her ears in 'Jupiter Ascending'". Chicago Entertainment – Chicago Sun-Times. Retrieved November 28, 2014. ^ "Gugu Mbatha-Raw admires Wachowskis – TV3 Xposé Entertainment". Tv3.ie. May 1, 2014. Archived from the original on May 3, 2014. Retrieved May 28, 2014. ^ "Brothers Unleash the Comic Book of Ideas". nytimes.com. April 5, 1999. Retrieved January 30, 2015. ^ Don Steinberg (January 29, 2015). "'The Matrix' Creators Launch a New Epic With 'Jupiter Ascending' – WSJ". WSJ. Retrieved January 30, 2015. ^ "'Jupiter Ascending' filmmakers thrive on being sci-fi originals". Toronto Sun. ^ a b Warner Bros. Pictures (April 15, 2013). "The Wachowskis' Jupiter Ascending Starts Filming". comingsoon.net. Retrieved April 20, 2013. ^ "Mila Kunis at Ely Cathedral for Jupiter Ascending filming". April 24, 2013. ^ "Fans hoping to catch a glimpse of Mila Kunis". April 24, 2013. ^ "'Jupiter Ascending': Can Warner Bros. Avoid Another Wachowski Misfire?". Variety. Retrieved June 17, 2014. ^ "Wachowski siblings in Bilbao – Euro Weekly News Spain". Euroweeklynews.com. May 10, 2014. Retrieved June 9, 2014. ^ Heuring, David (July 18, 2013). "Production Roundup – Yeoman, Fiore, Miranda, Steelberg and Toll". The ASC. Retrieved February 14, 2014. ^ "John Toll, ASC Relies on Codex for Iron Man 3". Codexdigital.com. Retrieved February 14, 2014. ^ "SGO Mistika | Legend3D Continues to Set the Pace with SGO Technology". Sgo.es. March 28, 2014. Retrieved July 26, 2014. ^ Ian Christie Updated: March 11, 2014 (March 11, 2014). "Digital native: Chris Parks | Sight & Sound". BFI. Retrieved July 29, 2014. ^ "Vision3 | Stereo 3D Production Expertise". Vision3.tv. Retrieved July 29, 2014. ^ "Channing Tatum and Jamie Foxx Talk JUPITER ASCENDING and SPIDER-MAN 2". Collider.com. Retrieved June 9, 2014. ^ "'Jupiter Ascending' Takes Channing Tatum To Places He's 'Never Gone Before'". MTV. Retrieved June 9, 2014. ^ "Mila Kunis Talks Working With Channing Tatum on Jupiter Ascending: He Literally Saved My Life | E! Online UK". Uk.eonline.com. March 28, 2014. Retrieved June 9, 2014. ^ By Erik Sofge (May 30, 2014). "The Real-Life Science Behind The Summer's Most Outrageous Sci-Fi Movies". Popular Science. Retrieved June 9, 2014. ^ "Framestore Uses Vicon T40 Cameras for Pre-Vis on Gravity, Jupiter Ascending". Digital Cinema Report. November 21, 2013. Retrieved June 9, 2014. ^ filmmusicreporter (March 5, 2013). "Michael Giacchino to Score 'Jupiter Ascending'". filmmusicreporter.com. Retrieved April 20, 2013. ^ "Twitter / m_giacchino: Ludwig Wicki Conducting the". Twitter.com. June 10, 2013. Retrieved February 14, 2014. ^ "SFX239 Preview: Composer Michael Giacchino On Jupiter Ascending". SFX. August 20, 2013. Retrieved August 20, 2013. ^ Sepinwall, Alan (October 10, 2012). "An epic interview with the Wachowskis and Tom Tykwer: From Cloud Atlas to Jupiter Ascending". Hitfix.com. Retrieved June 13, 2014. ^ Polo, Susana (November 8, 2018). "Jupiter Ascending is getting a new life in ballet". Polygon. ^ The Deadline Team (March 14, 2013). "WB Dates Wachowskis' 'Jupiter Ascending', Shifts De Niro-Stallone 'Grudge Match'". deadline.com. Retrieved April 20, 2013. ^ "Wachowskis' 'Jupiter Ascending' Moves Up a Week to July 18, 2014". TheWrap. December 11, 2013. Retrieved February 14, 2014. ^ a b Ramin Setoodah (January 27, 2015). "'Jupiter Ascending' Debuts to Muted Crowd at Sundance". Variety. Retrieved January 28, 2015. ^ "'SpongeBob' to soak up box office, push 'American Sniper' out of top spot". latimes.com. Retrieved February 8, 2015. ^ Agar, Chris. "Box Office Prediction: 'American Sniper' vs. 'The SpongeBob Movie'". screenrant.com. Retrieved February 8, 2015. ^ "Forecast: 'SpongeBob' To Take Down 'Sniper' on First Weekend of February". boxofficemojo.com. IMDB. Retrieved February 8, 2015. ^ "The Riskiest Box Office Bets of 2015". screenrant.com. Retrieved February 6, 2015. ^ "'SpongeBob's $53M Pair of Pants; 'Jupiter' & 'Son' Descending – Late Night B.O. Update". deadline.com. Retrieved February 8, 2015. ^ "Friday Report: 'SpongeBob' Scores Super $15.1 Million". boxofficemojo.com. IMDB. Retrieved February 8, 2015. ^ Oldham, Stuart (February 7, 2015). "Two Hollywood Flops in One Weekend at the Box Office". Variety. Retrieved February 8, 2015. ^ "Jupiter Ascending Daily Gross". boxofficemojo.com. IMDB. Retrieved February 9, 2015. ^ "Weekend Box Office Results for February 6–8, 2015 – Box Office Mojo". boxofficemojo.com. ^ "Around-the-World Roundup: 'Jupiter' Ascends to Top Spot Overseas". boxofficemojo.com. IMDB. Retrieved February 8, 2015. ^ "'Jupiter Ascending' Rises To Number One at the International Box Office". deadline.com. Retrieved February 9, 2015. ^ "Around-the-World Roundup: 'Jupiter Ascending' Opens to $23 Million in China". boxofficemojo.com. IMDB. Retrieved March 8, 2015. ^ "'Jupiter Ascending': 9 Terrible Reviews That Might Knock the Sci-Fi Movie Out of Audiences Orbit". TheWrap. Retrieved July 29, 2015. ^ Joanna Crawley. "Eddie Redmayne is the best thing about Jupiter Ascending, here's why..." EntertainmentWise. Retrieved July 29, 2015. ^ "Movie review: Jupiter Ascending Review". The Cougar Chronicle. Retrieved July 29, 2015. ^ "Jupiter Ascending Is The Worst Movie Ever Go See It Immediately". ^ Jess Denham (February 10, 2015). "Has Eddie Redmayne scuppered his Oscars chance with Jupiter Ascending?". The Independent. Retrieved April 1, 2017. ^ "Jupiter Ascending". Metacritic. CBS Interactive. Retrieved February 11, 2015. ^ Pamela McClintock (February 6, 2015). "Box Office: 'SpongeBob' Nabs $15.1M Friday for $52M Debut; 'Jupiter Ascending' Falters". The Hollywood Reporter. Retrieved February 7, 2015. ^ Edelstein, David. "Jupiter Ascending Is Inane From First Frame to Last". Vulture. New York Media LLC. Retrieved March 10, 2015. ^ McGovern, Joe. "Jupiter Ascending review: Lost in space". Entertainment Weekly. Entertainment Weekly Inc. Retrieved March 10, 2015. ^ "Mark Kermode reviews Jupiter Ascending". YouTube. Retrieved March 25, 2016. ^ "Ramin Setoodeh on Twitter". Twitter. Retrieved January 29, 2015. ^ "The Wachowskis go for broke with the goofy space opera Jupiter Ascending". www.avclub.com. Retrieved January 2, 2016. ^ Blaustein, David (February 6, 2015). "Movie Review: 'Jupiter Ascending' Starring Mila Kunis and Channing Tatum". ABC News. Retrieved March 18, 2015. ^ Polygon Staff. "The 10 best movies of 2015". Polygon. Retrieved January 12, 2016. ^ Rosenbloom, Jordan (September 6, 2016). "What movies do audiences walk out of the theater divided?". medium.com. Retrieved September 12, 2016. ^ "Nickelodeon Announces Nominations for the '28th Annual Kids' Choice Awards'". Zap2it. February 20, 2015. Retrieved February 21, 2015. ^ "Meryl Streep gets her first Kids' Choice Awards nomination: See the full list". Entertainment Weekly. February 20, 2015. Retrieved February 21, 2015. ^ "'Fifty Shades of Grey' dishonored at anti-Oscar Razzie awards". Agence France-Presse. The Economic Times. Retrieved March 1, 2016. ^ "The 36th RAZZIE Awards". Eventbrite. Retrieved March 11, 2016. ^ Rahman, Abid. "'Fifty Shades of Grey' tops Razzie Awards". CNN. Retrieved March 1, 2016.